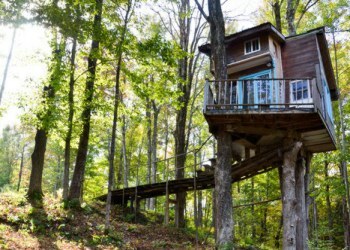 The treehouse is indeed a cozy little place perched on four maples 30 feet above a blanket of ferns. Access is by a ramp 70 ft. from the main house, where you'll have a private bathroom with shower. This quiet place in the woods has heat, electricity, and a small refrigerator. The main floor has a single bed, or climb the ladder to the loft with a queen sized futon and down comforter. Enjoy the comfy reading rocker or sit on the deck and gaze at Mt. Abraham and the Green Mountain National Forest. The hot tub is a sweet new addition to the place. For those less adventurous, there is a guestroom in the main house with a double bed. We have no pets and are very neat and tidy but you can bring your dog if you want. All linens and little complimentary toiletries are provided, and you'll enjoy a generous continental breakfast in the sunny dining room in the morning. It is hard to rate an experience when everything one has to say is so positive it comes off as over the top hyperbole. But, I'll do my best. 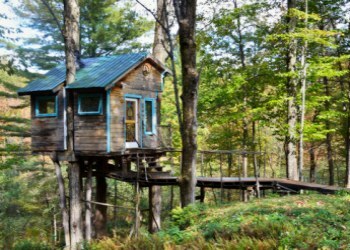 The Tiny Fern Forest Treehouse is every bit as magical in reality as it is in the pictures. The backdrop of the mountain and forest sets the tone, with clear bright stars and the forest every treehouse hopes to be nestled in. 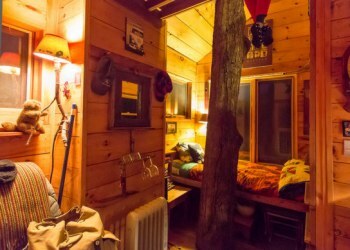 The treehouse itself is cozy and welcoming with a comfortable loft bed, a reading nook, and a porch perfectly positioned for bear watches. The hot tub is divine; the bathroom is luxurious; breakfast is the thing of legend. Ellie and H are the perfect hosts. The first thing we did when we got home was to check the schedule for when we could return.